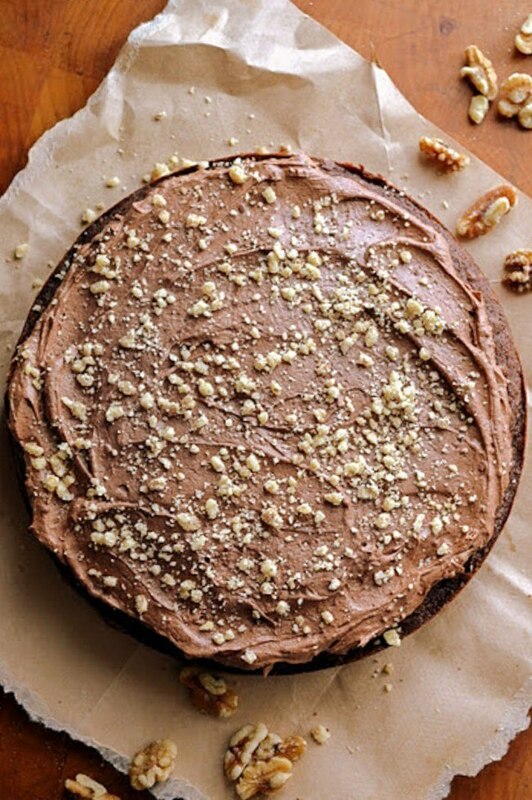 This Dark Chocolate Walnut Cake has a sophisticated European vibe with ground walnuts and dark chocolate, it's moist, not too sweet, and super delicious! Butter and flour a 9-inch spring form pan. Mix the flour, cocoa powder, and baking soda into a small bowl along with the ground walnuts. Cream the butter using a hand mixer or in the bowl of a stand mixer. Add both sugars and beat until fluffy. Beat in eggs 1 at a time. Beat in vanilla, then melted chocolate. Add dry ingredients alternately with buttermilk in 2 additions each, beating just until blended after each addition. Spread the batter into the pan and bake until a tester inserted into center comes out with a few moist crumbs attached, about 35 minutes. Cool cake in pan on a rack. For the icing, melt the chocolate as above and set aside. In a large bowl cream the butter and add in the sugar and cocoa powder, beating until smooth. Beat in 2 tablespoons of buttermilk and the vanilla. Beat in the melted chocolate. Thin with buttermilk if it's too stiff to spread nicely. This makes enough frosting to cover the cake with a thick layer, but I like it just on top.